S-Cross line-up and gives it more macho looks and new engines. 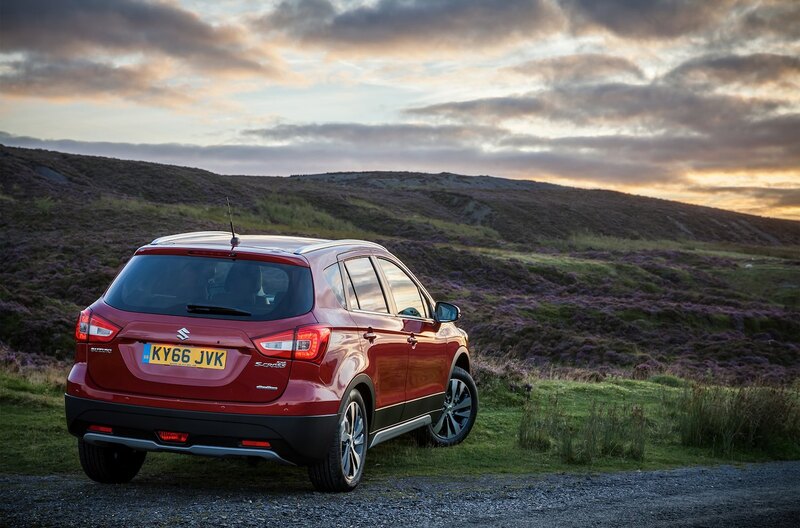 Jonathan Smith reviews the latest Suzuki S-Cross Range. Sometimes success can bring its own problems. The new Suzuki Vitara, launched 18-months ago, was a runaway success – great news for Suzuki. But the chunky SUV which looks like a miniature Evoque somewhat eclipsed the Japanese manufacturer’s established crossover, the S-Cross. While sales of the Vitara surged, popularity of the slightly larger S-Cross waned. The result is a significant rethink to the S-Cross styling giving it greater impact and making it look more like an SUV with a higher ride height and a distinctly aggressive 10-bar vertical grille. It now has a more robust nose, along the lines of a smaller Landcruiser. The cabin has also been treated to some fine tuning to give it a more upmarket feel. Perhaps best news of all is the latest engine line-up. Replacing the 1.6litre petrol unit are two new innovative Boosterjet engines which offer better torque and economy alongside impressive flexibility. There is also a 1.6litre diesel version, but the economy of the petrol models are so miserly these are likely to become the best sellers. Prices start at £14,999 and go up to £24,349 when the new S-Cross goes on sale here on October 17 – that’s about £1,000 up on the outgoing versions. A six-speed automatic is available on both petrol models for about £1,300 extra. The baby of the range is the three-cylinder 988cc power pack that knocks out no less than 108bhp. Despite the tiny capacity, pulling power is better than the model it replaces. And with CO2 emissions of 113g/km it is both frugal to tax and run. Some three-cylinder engines can sound rather strained and strangely off-beat. But the S-Cross is refined and relaxed with little sign of vibration or harshness. The majority of UK buyers go for two-wheel-drive when buying small SUVs, and S-Cross purchasers follow this trend with around 25per cent of owners opting for all-paw traction which is available on the top two grades and with all three engine options. This percentage is actually noticeably higher than rivals. I first sampled baby of the range, the 1.0litre, three-cylinder and came away questioning whether most potential owners really need anything more powerful. The free-revving little engine is as eager as it is smooth and coupled with a slick five-speed gearbox it was undaunted by the steep gradients of the North Wales test drive. Despite its sizeable five door body, 62mph is seen off in a crisp 11 seconds and it goes on to a max of 111mph. Cruising at around the legal limit is quiet and unflustered. Legroom front and back is about par for the course with ample headroom for all. The rear boot is more generous than most with a capacity of 430litres. Soft touch plastics help make the fascia a tad classier as do new seat fabrics. The SZ4 comes with rear privacy glass, leather steering wheel, electric door mirrors, front fog lights and heated door mirrors. And the SZ-T adds rear parking camera, sat-nav, daytime running lights and auto headlights and auto dim rear mirror. The top of the range SZ5 crowns the line-up with leather heated seats, huge sliding double panoramic roof, radar brake support and adaptive cruise control. Obviously, the 138bhp 1.4litre Boosterjet version with another 30bhp lifts performance to a higher level, but it certainly doesn’t make the 1.0litre feel inadequate. Mid-range pick-up is noticeably more enthusiastic and with the optional six-speed auto box progress is speedy and relaxed. A paddle change on the steering wheel encourages keener drivers to get stuck in, no bad thing. Fuel consumption is slightly impaired but emissions remain low with a figure of 128g/km and most drivers will easily get around the 40mpg mark. Suzuki’s own four wheel drive system has four driving modes including sport, snow, lock and hill hold. In normal conditions, power is fed through front the wheels only.